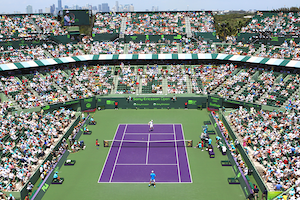 Tag Archive | "Sony Open"
(March 29, 2014) Serena Williams came back from a 2-5 deficit in the first set to win 11 of the next 12 game to close out Li Na 7-5, 6-1 to claim a record-setting seventh Sony Open title on Saturday. This marks Williams’ 59th title of her career, 14 more than any other currently active player on the WTA Tour and the seventh most in history. Williams came out sluggish in the first set going down two breaks to Li to trail 2-5. Li served for the set twice and had one set point which Williams overcame. “Sometimes I do get off to a slow start, but then again, sometimes I get off to a fast start,” Williams said. “I just remember being down. She was playing so well, and at that point I just was trying to just stay focused and stay in the game. “Then I remember really ‑‑ some of the crowd was so intense. I thought, Wow, they really want to see a good match, I’ve got to try harder, I’ve got to do better. “I really thought I could do better at this point,” Williams explained. “My serve, percentage was super, super low, I think in the 30s, and I thought, Okay, I can serve a little better, and I know I can return better, and I’m practicing all these years and I have a good return. I need to start doing it. I need to start doing what I practice. During the trophy ceremony, the two 32-year-old veterans shared a laugh on the podium. “I just feel that both she and I, we just have this never‑give‑up fight, and it just goes to show that, you know, you can still shine at any age.” Williams commented. “We were talking about for sure before the match they say, Oh, two old women come to the final,” Li said with a smile. “I was so happy for her and us and how we were doing,” Williams said. “We’re playing great tennis and we’re both 1 and 2 and, you know, we’re both the same age. “For me, it was just an honor to be there with her. We have had ‑‑ we are living the same life, and at this stage, to be on top, I don’t think it’s been done before and I think it’s really awesome. Williams is the oldest player, at 32 years and six months, to win the Miami title; Chris Evert (in 1986) is the only other player to have won the title after their 30th birthday. Williams is the fourth player, after Chris Evert, Steffi Graf and Martina Navratilova, in the Open Era to win the same tournament seven or more times. After a wild Wednesday at the Sony Open Tennis tournament in Miami, the first men’s singles semifinal is set. It will not be a rematch of the Indian Wells final between Novak Djokovic and Roger Federer. Instead, Djokovic will be going up against Kei Nishikori. Djokovic beat Andy Murray 7-5, 6-3 before Nishikori upset Federer 3-6, 7-5, 6-4. Despite the straightforward scoreline compared to that of the nightcap, even Djokovic’s quarterfinal win was not without some dramatic moments. With Murray serving at 5-5 in the first set, Djokovic appeared to reach over the net to put away a volley for a 0-15 lead. The Serb even admitted it, but chair umpire Damian Steiner said that the racket had made contact with the ball prior to crossing the net. Obviously disgusted although keeping his outward emotions mostly in check, Murray promptly dropped serve at love to end the set. That meant that Murray, who had earned a break point at 5-5, lost the final seven points of the opening frame. “Look, I’m going to be completely honest with you,” Djokovic told the press. “I did pass the net with my racket and I told Andy that. I told him that I did not touch the net. My bad. I thought that it’s allowed, to cross on his side without touching the net. That’s why I thought I won the point. What the second semifinal lacked in controversy, it made up for in competitiveness. An in-form Federer seemed to be on his way to another dominant victory in Miami with a set and a break lead in hand, but Nishikori had other ideas. Japan’s top player had saved four match points to outlast David Ferrer in a third-set tiebreaker the previous day, so he was not about to go down without a fight. Nishikori broke back then wrapped up each of the final two sets with breaks–at 6-5 in the second and 5-4 in the third. He now leads the head-to-head series against Federer 2-1. It’s still a long way away with two of the greatest players of all time on opposite sides of the draw, but Roger Federer and Rafael Nadal are playing like they want to deliver another installment of one of tennis’ best-ever rivalries in the final of the Sony Open Tennis tournament. Federer and Nadal lost a combined lost a combined seven games in fourth-round blowouts on Tuesday. The fifth-ranked Swiss rolled over Richard Gasquet 6-1, 6-2 during the afternoon before Nadal eased past Fabio Fognini 6-2, 6-2 at night. In three matches so far, Federer has not dropped a set and he has surrendered only nine games in total in his last two rounds. The Indian Wells runner-up turned in a near-flawless performance against Gasquet, striking six aces without double-faulting while converting five of six break chances and saving the only break point he faced. 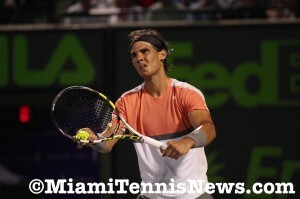 It was hardly a match at all for Nadal against an uninspired Fognini. The Italian never appeared to have any belief and he also moved gingerly with his thigh heavily taped. It all resulted in one hours and two minutes of one-way traffic. Miami’s No. 1 seed has now yielded a mere nine games in three matches at this event. Andy Murray had a similarly routine day at the office in a 6-4, 6-1 win over Jo-Wilfried Tsonga. Murray lost a miniscule six points in eight service games while advancing in one hour and 13 minutes. Next up for the Scot is a showdown with Novak Djokovic, who defeated Tommy Robredo 6-3, 7-5. It will be a Serena Williams-Maria Sharapova semifinal at the Sony Open and both women defeated quarterfinal opponents in straight sets. No. 1 Serena Williams made quick work of No. 5 seed Angelique Kerber 6-2, 6-2 in the first match of the night session on Tuesday. “I’m playing a little better,” Williams said. “I had to play better. As the tournament progresses you can’t get worse, you have to get better. No. 4 seed Maria Sharapova came back from a break down in the first set in a rematch of the 2011 Wimbledon final to top Petra Kvitova 7-5, 6-1. “I started getting more chances as we played more games in the first set,” Sharapova said. “Little by little I started seeing more opportunities and started getting myself back in the points and playing my game, playing well, going inside the baseline. It will be Williams against Sharapova for a place in the Key Biscayne final. Williams holds an overwhelming lead against the Russian 15-2. The last time Sharapova beat Williams was back in 2004.